1. Pre-existing knowledge: First we surveyed the existing literature on the building block of enabling environments for agro-industries. We then consulted with various key seed sector informants to come up with a long list long list of relevant variables. Consultation with several established indexes guided the target numbers and classification of indicators. 2. Industry survey: Second, we conducted a survey of African seed sector players to evaluate the importance of each indicators resulting in a smaller subset of key indicators. The survey was completed by 167 respondents including private seed companies (53.9%), non-governmental organizations (6.5%), government departments (15%), and research institutions (18.6). 3. Lessons from pilot: In 2005. TASAI concluded pilot studies in Kenya, Uganda, South Africa and Zimbabwe. Key lessons from these pilot studies both sharpened the focus on the index and added four new indicators. The table below shows 20 indicators that form the core of TASAI. You can click on each indicator to see an expanded description of its role, measurement and sources of information. In addition to these core indicators, some countries may have a few other indicators that are critical to the local seed sector. Some indicators are measured independently for each focus crop while others are sector wide. The last column shows the hypothesized impact of increased indicator performance on seed access by smallholder farmers. Every country needs breeders to develop locally adapted varieties. This indicator tracks the number of active breeders in both the public and private sectors for the target crops. Information on this indicator usually comes from Seed companies; National Agriculture Research Systems (NARS), Consultative Group on International Agricultural Research (CGIAR) centers. The government agency responsible for the seed industry releases varieties that have been approved through various regulatory channels. The varieties are usually listed in a National Seed Variety Catalogue. This indicator tracks the number of varieties that have been released in the three years preceding the study. Foundation seed is pure seed stocks grown by or under the supervision of a public agency for use in the production of registered and certified seed. Seed companies that do not breed their own varieties, access basic seed from various sources including the government agricultural research programs, international agricultural research institutions, other seed companies, among other sources. This indicator tracks the perception of seed companies of the availability of this early generation seed. This indicator tracks the age of the varieties sold, based on the year when the variety was released by the regulator. The assumption is that the old varieties do not respond well to the current conditions influenced by climate change and new pests and diseases. New varieties are bred to respond to these conditions. This information is acquired from seed companies, government institutions as well as the variety release catalog. Improved seed offers perhaps the cheapest way for farmers to adapt to climate change because farmers can use the seed without any need for additional training. This indicator tracks the number of varieties that have at least one climate-smart feature. These features include drought tolerance, flood tolerant, early-maturing and extra-early maturing. Competition breeds excellence! This indicator tracks the number of companies that are registered and active in a country, engaged in the production and sale of certified seeds for the focus crops. In most countries, seed companies are registered and regulated by the Ministry of Agriculture. Active seed companies are those that have made sales in the reporting year. For a host of reasons, countries might need to import seed. This indicator tracks the time it takes for the entire process of importation from the application of an import permit, to the time when the seed consignment is approved to be released (from the point of entry) to the importer. As a measure of market power concentration, this indicator tracks the seed sales for each active company and reports the combined the market share of the top four companies. The Herfindahl-Hirschman index (HHI) is also used to track market concentration. In some countries, the government owns (wholly or partly) entities that produce and market seed to farmers. This involvement by government often has the effect of crowding out the private sector. This indicator tracks the seed sales by government parastatals and measures these sales as a percentage of total seed sales. Variety testing and release regulations can be a major impediment in getting improved varieties to the farmers. This indicator measures the time it takes for the entire process of variety release, from the time when the variety is submitted for testing in National Performance Trials (NPTs), to the point it is approved/released by the Variety Release Committee. The expectation is that the variety will be immediately registered on the National Variety List. This indicator tracks the status of the relevant seed-related policy instruments. These include the national Seed Policy, Seed Act, Seed Regulations and the Plant Variety Protection Act. The status outlines the various stages of these policy instruments (no instrument at all, instrument at draft stage/not yet passed, instrument passed as policy/law, recently amended). Seed policies are implemented through various policy instruments including Seed Laws, Seed Regulations, Plant Variety Protection Acts, among others. This question seeks to assess the level of satisfaction of seed companies, with the enforcement/ implementation arrangements of the seed law. This indicator is measured as an opinion of active seed producers. Seed inspectors play several crucial roles at different stages of the seed value chain including production (e.g. testing of seed performance in the field) and marketing (e.g. inspecting seed dealers and agents at the retail level). For each country, TASAI tracks the number of available seed inspectors. Further, we track the opinion of seed companies on adequacy of the seed inspectors. Counterfeit of fake seed is a major threat to the entire seed industry. In most cases, fake seed is grain sold to farmers as certified seed by unscrupulous agents. This is an opinion indicator, targeting seed companies to assess the industry’s efforts to stamp out fake seed. Where available, TASAI also tracks the number of cases of fake seed reported to government authorities each year. This indicator aims to assess the extent to which the government uses a smart subsidy program, by tracking the following four components: (1) Size and value of the subsidy program, as a percentage of the overall seed market, (2) Distribution system for the subsidy program, whether through private or public institutions, (3) If the subsidy is administered as a price subsidy, what % of the seed retail price is subsidized by the program? (4) Does the subsidy specifically target the poor farmers who would otherwise not access improved seeds? Functional agricultural extension services are critical to both adoption and usage of improved seed by smallholder farmers. This indicator tracks the ratio of extension officers (from both the public and private sector) to farming households. National seed traders associations are a key conjoint between the private sector interests and government involvement. 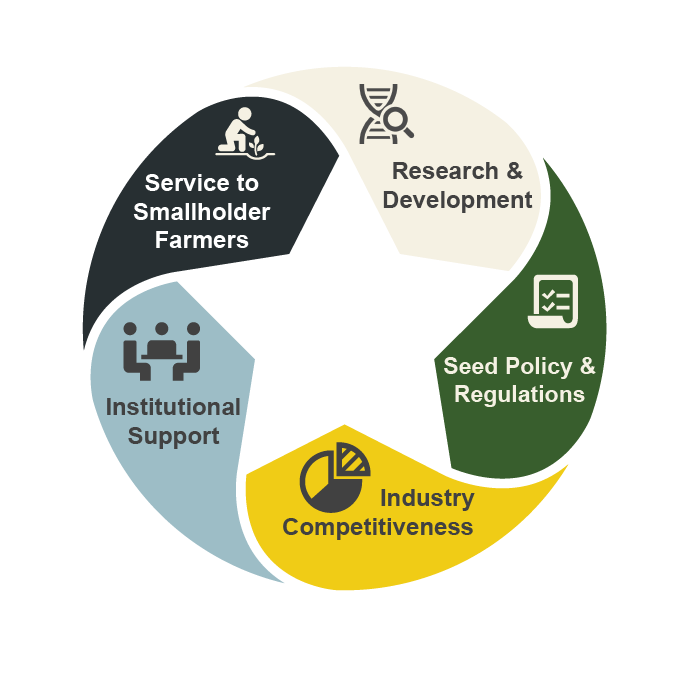 Through this indicator, the national seed traders’ association is assessed by all its members on a number of performance parameters including governance, management, representation, effectiveness in advocacy, and value to members. Agro-dealers play a key role in closing the last mile in seed distribution systems across Africa. In many cases, they are main point of sale of certified seed. This indicator tracks the ratio of agro-dealers to farming households. Most farmers in Sub-Saharan Africa are small-scale. Availability of seed in small packages is critical to inducing trail (adoption) and well as making seed more affordable. This indicator tracks the availability of seed in small packages, i.e., what % of seed is sold in these various package sizes (usually 2kgs or less). Most smallholder farmers make the choice to purchase seed from the formal sector or plant grain. The indicator is a ratio of the price of certified seed (per kg) with the farm-gate price of grain (per kg), at the time of planting.